Halfway through theatre season, we reach the end of the year. Here's the best part; you can see a show on New Year's Eve, and still have plenty of time to get to a New Year's party. Mad Cat Theatre presents Macbeth and the Monster at The Light Box at the Goldman Warehouse through January 8, 2012. Soul Doctor: Journey of a Rock-Star Rabbi plays at The Colony Theater in Miami Beach through January 8. The production moves to Fort Lauderdale's Parker Playhouse the following week, where it will play through January 29. If you find yourself down by Key West, check out August: Osage County at The Waterfront Playhouse. Through January 14. The Stage Door Theatre production of Irving Berlin's I Love A Piano plays in Theatre 2 through January 8. Actors' Playhouse critically acclaimed production of Jacob Marley's Christmas Carol plays through January 1, 2012, and there isn't a better choice for a holiday play. Million Dollar Quartet plays at The Adrienne Arsht Center for the Performing Arts through January 1, 2012. Cirque Dreams Holidaze is wowing the crows at the Broward Center for the Performing Arts through January 1, 2012. Showtime Dance & Performing Arts Theatre presents The Prince of Egypt through January 14, 2012. The national tour of Million Dollar Quartet opened at the Adrienne Arsht Center for the Performing Arts on December 27, 2011. On December 4, 1956, rock 'n' roll icons Elvis Presley, Johnny Cash, Jerry Lee Lewis and Carl Perkins were gathered together by Sam Phillips (the ''Father of Rock 'n' Roll'') at Sun Records in Memphis for the first and only time, for what would be one of the greatest jam sessions of all time. Eric Schaeffer directed a cast that featured Lee Ferris, Martin Kaye, Derek Keeling, Cody Slaughter, and Christopher Ryan Grant. ...from the opening notes of “Blue Suede Shoes “(One for the money, crash; two for the show, slam; three to get ready, slap; now, go, cat, go) Million Dollar Quartet is usually an express train joyously running out of control. ...Kaye is the crowd-pleaser as a vibrant cage-rattler Lewis, down to his signature arched back and foot-stomping. But the surprise is the quiet but commanding brio of Ferris who, of all the cast seems to be the most accomplished musician. His lead guitar licks are rock ’n’ roll incarnate. The show was directed by the Eric Schaeffer, best known for productions of Stephen Sondheim revivals at his Washington, D.C., Signature Theatre. He hasn’t got a lot to work with here; it’s like assigning Richard Avedon to shoot family portraits at K Mart. The jukebox musical’s story might be thinner than the 1956 model Elvis, but for pure entertainment Million Dollar Quartet is worth a million bucks. ...refreshingly compact at about 90 minutes with no intermission, Million Dollar Quartet transcends simple impersonation. The cast captures the essence of these famed musicians, but the performances never feel like slavish karaoke. Keeling has by far the richest, most resonant voice and his booming Cash, on Tennessee Ernie Ford’s hit Sixteen Tons and Stan Jones’ (Ghost) Riders in the Sky, is top-shelf. Slaughter’s Elvis, by comparison, is vocally thin and scratchy on such up-tempo hits as Hound Dog but warm on ballads such as Memories Are Made of This. His dancing and agile stage movements, however, are better. Lee Ferris’ oft-cranky Perkins consistently fires off tasty licks on his guitar. Martin Kaye has the biggest shoes to fill — blue suede or not — as he follows Levi Kreis’ Tony-winning performance on Broadway as Lewis. Kaye, irrepressible as the lovable enfant terrible, gets all the script’s best lines and delivers them with brio, humor and accompanying body language. Kaye’s musicianship, as he athletically pounds the piano, would test the skills of the finest pianist. By all means, if you go — and you should — don’t bolt after curtain call. The rockabilly quartet returns in glittering jackets for a five-song encore, á la the Mamma Mia! musical, and it’s an irresistible coda to a fun show. Million Dollar Quartet plays at the Arsht Center through January 1, 2012. Fortunately, the local theatre scene can't be turned off at the whim of The Speaker of the House, so you'll be able to step out from whichever holiday you're celebrating to take in a show. Just in case you needed proof that Christmas isn't the only thing going on this week, Soul Doctor: Journey of a Rock-Star Rabbi opens Christmas day at The Colony Theater in Miami Beach, where it plays through January 8. The production moves to Fort Lauderdale's Parker Playhouse the following week, where it will play through January 29. The Broward Stage Door Theatre production of Irving Berlin's I Love A Piano plays in Theatre 2 through January 8. The critically acclaimed Zoetic Stage production of David Sedaris' The Santaland Diaries ends its run at the Arsht Center on December 23, 2011. Crest Theatre presents Steve Solomon’s My Mother’s Italian, My Father’s Jewish and I’m Home For The Holidays, December 22 through the 24th. Madeline's Christmas plays at Actors' Playhouse every Saturday through December 24, 2011. Madeline may have always been "the smallest one," but she always had the biggest heart. So, too, does Sawyer O'Keefe, one of the ten-year-old actresses playing Madeline at Actors' Playhouse. The Examiner tells us about her, and lets us know that the Playhouse is holding a toy drive throught Christmas Eve. New Times sits down with Paul Tei to talk about 12 years of Mad Cat. We fill a huge void in the theatrical community here, but it feels like Mad Cat is the lone punk band that shows up to a battle of the bands showdown and all the other groups are cover bands, ya know? Talkin' Broadway brings us up to speed on the new Theatre at Arts Garage program, helmed by former producing director of Florida Stage, Louis Tyrell. "Picture Florida Stage, but more intimate. Just as devoted to producing new plays and developing new playwrights, but with less emphasis on production values. The space—and it is a great space—will dictate the kinds of plays we will be able to do here" said Tyrell. Plays with smaller cast sizes, usually only one set, but that leaves plenty of terrific scripts that we can serve up, many that I already have in hand." It sounds like he's going back to the design philosophy of the old Theatre Club of the Palm Beaches; what we used to call the "two chairs and a table" school of set design. Can you guess what it entailed? Florida Theater On Stage interviews music director Eric Alsford. James Cubby can't separate the performer from the performance when he interviews Elvis Presley for MiamiArtZine.com. Eileen Faxas has been on tour with Mama Mia, and started blogging about it awhile back. In this installment of BlogosFaxas, she discovers life outside suburbia. Why was my initial reaction negative, I ask myself. Then I realize. This place is not sleek and shiny and clean (or corporate). What it is, is original. It is then that I begin to see the humble origins, the work, struggle and striving in its facades. ...ask what top three things we should do to improve the economy, no one answers “subsidize the arts.” But... ask people what would improve their neighborhood the most, the arts come up time and time again. Why? Because artists’ residences are known to herald an improvement in real-estate values; because arts audiences mean feet on the street and therefore greater public safety; because arts venues are known to spawn coffee shops and restaurants and other places of urban liveliness. Examples of this abound in our own South Florida; when the Broward Center was built, its neighborhood was a blighted warehouse district populated by homeless people. Actors' Playhouse moved into a theater surrounded by wedding shops that closed at 5pm. While they tore down the ghetto before they built The Kravis Center, that meant that it sat in the middle of a wasteland. Now look at those areas; restaurants, galleries, and vibrant night life can be found at all three locations. Florida Theater On Stage has a list of gifts for the hard-to-shop-for musical lover in your life. BroadwayWorld reports the recipients of the 2012 Muse Awards in Palm Beach County. They are awarded by the Palm Beach County Cultural Council. The Maltz Jupiter Theater garnered awards for the theater's namesakes Milton and Tamar Maltz (Outstanding Civic Leader) , and its Artistic Director, Andrew Kato (Council's Choice). Congratulations! There are no regional productions opening this weekend, but there are a few touring productions and one-offs; you'll find them under "passing through" below. Our "don't miss" production is All My Sons at DramaWorks; maybe we'll see you there this weekend, and this weekend is your last chance to see it. But there's a lot of good stuff playing at the moment; Jacob Marley's Christmas Carol is everything the reviews say and more, as is The SantaLand Diaries. Actors' Playhouse production of Jacob Marley's Christmas Carol plays through January 1, 2012. Zoetic Stage presents David Sedaris' The Santaland Diaries at the Arsht Center through December 23, 2011. The Maltz Jupiter Theatre production of Joseph and the Amazing Technicolor Dreamcoat closes December 18, 2011. New Theatre's production of Twain and Shaw Do Lunch at their new home at The Roxy Performing Arts Center winds up its run on December 18, 2011. Woyzeck, the Muscial finishes its run at The Jesus Quintero Performing Arts Theatre on December 18. The Palm Beach DramaWorks critically acclaimed production of Arthur Miller's All My Sons ends its extended run on December 18. Mazel Musicals and the Broward Center present How Lucky Can We Get, The Songs of Kander and Ebb at the Aventura Arts and Cultural Center, through Sunday. The Barter Theatre presents its production of Miracle on 34th Street at the Broward Center for the Performing Arts this Saturday only. The Barter Theatre is in Virginia, and they have an excellent reputation; worth checking out. The Red Thread returns to The Playground Theatre, through December 18. The Life and Adventures of Santa Claus plays 2 matinees at the Rose & Alfred Miniaci Performing Arts Center this Saturday, December 17th only. This is part of Broward Center's Family Fun Series, so it includes free arts & crafts, face painting, and snacks provided courtesy of Whole Foods. The Stage Door Theatre opened its production of Irving Berlin's I Love A Piano on December 2, 2011. Join us for a nostalgic journey that spans seven decades of American history as seen through the eyes of legendary songwriter Irving Berlin. Including timeless classics such as “White Christmas,” “God Bless America,” “Puttin’ On the Ritz,” and “There’s No Business Like Show Business,” I Love a Piano does more than define the music of a generation - it defines the music of our country. With such irresistible raw material as the Irving Berlin songbook, Broward Stage Door’s production of I Love a Piano can’t help but be mildly entertaining and this edition finally emits infectious joy during the last 15 minutes. But for frequent theatergoers who have seen songbook after songbook, year after year, decade after decade, the doctor diagnoses a new malady: revue fatigue. The moldy formula here, as in so many other less inspired revues, is to hire singer/dancers, assign them a composer’s greatest hits, weave in the lamest of connective tissue and hope you find as good a musical director as Stage Door has in David Nagy. Intersperse jaunty standards with heartfelt ballads and dust them off with new arrangements. Hire an experienced director/choreographer as Stage Door has with Jonathan Van Dyke. Play for 90 minutes, usually with an intermission. Accept the applause from audiences whose pleasure is partly due to the private recollections summoned by each warhorse number. This revue was conceived by Michael Berkeley and Ray Roderick, who created shows featured at Florida Stage including Heaven Help Us! (The Rat Pack Musical). The songs tick off a lengthy list of Berlin essentials... But they wisely pull some numbers from Berlin’s trunk of 1,500 works that younger listeners might not have heard before. That helps the audience better appreciate the freshness of his melodies and the inventiveness of his lyrics. ...the revue’s only strength is Berlin’s genius: jaunty syncopated numbers, ragtime roof-raisers, surprisingly moving ballads, wry lyrics and a talent for pure melody that was rarely equaled. Stage Door assembled a cast of competent singers... The cheerful and earnest corps includes Robert Arthur, Samantha Bryce, Erin Edelle, Will Hutchenson (a professional who ignored his dead microphone and kept belting), Bethany Wagner and especially Michael Karraker who has a warm baritone and a dynamic dancing style that had him bouncing off steps like a parkour enthusiast. Van Dyke knows how to move these pieces along and choreograph vignettes with a bit of humor. Praise is due Nagy who skillfully melded the voices of the ensemble and leads a live three-piece pit band (no taped tracks this time) who may be the most talented performers on the stage. The Stage Door Theatre Production of I Love A Piano plays through January 8, 2012. Zoetic Stage opened its production of The Santaland Diaries at the Adrienne Arsht Center for the Performing Arts on December 8, 2011. A blisteringly funny evocation of Christmas Hell. One man's hysterical and often insightful look at the humilities, frustrations and joys of working as an elf at Macy's Santaland. This holiday classic is David Sedaris at his biting best and a reminder why Sedaris is one of the greatest humorists of our time. Stuart Meltzer directed Michael McKeever. ...McKeever's middle name is Renaissance, not because he's really old but because of his many talents. You want a new play? You want an actor, an artist, a set designer? Someone who can sing “Away in The Manger” and make you think he's Billie Holiday? Then you know who to call. And by the way, he designed the gorgeous Christmas tree, present laden, candy cane set on which he cavorts as Elf Crumpet. Don’t be misled by the loveliness of the set, which was designed by the show’s star, Michael McKeever. The SantaLand Diaries isn’t for those who revere Christmas, nor is it suitable for the kiddies. But if you can laugh at the idea of parents art directing their childrens’ Santa photos, a lusty older elf coming on to all those mommies or a particular corner where kids hurl before they even get close to Santa’s lap, well, SantaLand may just be your cup of spiked eggnog. Staged by Stuart Meltzer, Zoetic’s The SantaLand Diaries takes us along on one man’s journey from joblessness to a holiday season spent playing an elf named Crumpet. As with any job, there are stresses: moody Santas, racist parents, the embarrassment of having to walk through the actual store while decked out in a red and green costume, candy-cane socks and a jingle bell-tipped collar. On his final night as an elf, Crumpet experiences a swell of sentiment, one that Sedaris and McKeever undercut with jolting glee. McKeever’s performance is pitched just right: wry yet warm, energetic even as he’s describing the weirdness of life as an elf. He nails Sedaris’ skewed but somehow compassionate way of looking at the world. He’s funny, sardonic and, underneath it all, undeniably sweet. The multitalented McKeever breezes across the stage with an athletic and playful dexterity that lets audience members know they're in on the joke. And his comedic timing really brings Sedaris's stinging commentary to life. The stage design by Stuart Meltzer, who also directs, looks like a Christmas bomb went off. Ostensibly a mockup of Santaland at Macy's, there is an amalgam of fake gifts, fake snow, fake candy-cane pillars, and colored lights surrounding Santa's throne, made of fake gold. From the blinking holiday lights accompanied by a "Hallelujah" chorus as McKeever transforms from tie-wearing guy to Crumpet the elf, to the several oversize martinis he swigs throughout the play, nothing is understated. Meltzer and McKeever make the most of the small stage to full comedic effect. The Zoetic Stage production of The Santaland Diaries plays at the Arsht Center through December 23, 2011. Actors' Playhouse at the Miracle Theater opened its production of Jacob Marley's Christmas Carol on December 9, 2011. Move over Scrooge, its time for Jacob Marley to tell his story! Join Marley and his heroic behind-the-scenes effort to save old Scrooge's soul - and in the process save his own, in this delightful gem of a show. Chained and shackled, and condemned to a hellish eternity, Jacob Marley desperately attempts to free himself and escape his own chains, but first he must redeem Scrooge. Filled with laughter and terror, redemption and renewal, this wonderful play is irreverent, funny, and a deeply moving twist on Dickens' classic, told with warmth and infectious zest. David Arisco directed Ken Clement in this one-man adaptation. Carbonell Award-winner Ken Clement tackles the one-man show, capably portraying Marley, as well as the narrator and 16 other roles, ranging from the Bogle, his miniature guide in the spirit, to Scrooge, Bob Cratchit and the Ghosts of Christmases Past, Present and Future. Clement’s flamboyant manner leads the audience through the story as he deftly switches characters on a dime. His turns are staged on a minimalist set from Gene Seyffer, a series of rounded platforms sparsely decorated with a small desk and antique chair, and a trunk and screen that primarily serve as storage place for all sorts of clever props. While the set provides an imaginative blank canvas for Director David Arisco, Patrick Tennent’s carefully considered lighting design and accompanying sound design from Alexander Herrin provide the magic, accentuating every nuance of Clement’s performance and setting the scenes at every turn. At many South Florida theaters, the technical categories are often a neglected afterthought at best, but here they are integral to the success of the production. One actor playing 18 roles—from Marley to Crachit—provides a potential acting tour de force that actor Ken Clement embraces wholeheartedly. Clement deftly goes form character to character without ever seeming forced or contrived. Each is clear and separate. Though the story is a dark one, he manages to find what humor lies in the script. He also manages to avoid being too mushy or sentimental with the handling of story or overacting any of the characters. Surely, immense concentration is required to keep the pace going forward in a 90-minute show with no one to act off of but oneself. The stage ...holds a caul of lanterns overhead, their lights flickering on and off during the show like distant stars. Sound is also used well to add slight effects to the voices of some of the characters, helping them to sound more ominous. Both provide just the right magical and mysterious light-handed touch to this evening of a visit with an often overlooked character, and his own touching story of salvation. Gosh, we're lucky, those of us who go to the theatre in South Florida. 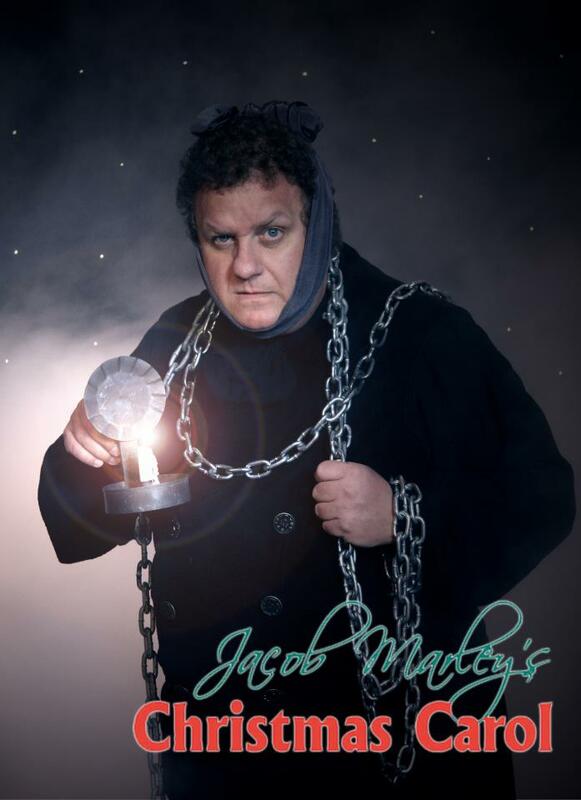 And amongst the luckiest are those who catch Ken Clement in Jacob Marley's Christmas Carol at Actors' Playhouse. Written by Tom Mula and directed by David Arisco, Marley has Clement playing a cast of thousands. Or so it seems. The pr says more than thirty, the program lists eighteen, and I lost count. Regardless, you'll sit there with gaping mouth and popping eyes as Clement disappears into the characters of Dickens' London. It's a dark, simple set by Gene Seyffer; a three level platform with raised desk, stool and guttering candle, wooden chest, fabric draped armchair and dressing screen. And the ceiling is hung with dozens of small lanterns, used to great effect. Credit Patrick Tennent. So thank you, Arisco, Seyffer, Tennent and sound man Alexander Herrin for this early Christmas present. And to Ken Clement, thanks for showing us all how to do this acting thing. I’ve been saying for years that if I were an artistic director that I’d design a season just to give work to certain performers and that near the top of the list would be Ken Clement. Both narrator and stand-in for the 17-member cast of characters, Clement is a master storyteller enthralling us around an invisible campfire with playwright Tom Mula’s 90-minute alternate take on Charles Dickens’ classic that many people have grown weary of. It’s hard to know what is the greater achievement of Clement and director David Arisco — creating characters so distinct from each other than you are never confused who’s talking, or the instant switches among characters arguing among themselves. ...unquestionably, Clement’s skill at selling the tale makes this work. In other hands, some of the passages might sound cloying and saccharine. But Clement always finds the truth of each moment whether its silliness or sentimentality, employing an expressive face, eyes that always harbor a little pain even while seeming merry, and a chameleonic voice that ranges up and down the entire vocal scale. ...special credit goes to lighting designer Patrick Tennent who created a score of effects from a green-hued monster to the bowels of Hell through an ever-shifting array of lights. Instantly switching spotlights and accompanying sound cues must keep production stage manager Carl Waisanen from being able to rest more than a few seconds at a time. This show indeed is satisfying for all ages, but it’s essential viewing for people who love theatrical storytelling. Jacob Marley’s Christmas Carol takes Charles Dickens’ beloved holiday classic and considers it from another perspective. Like Stephen King’s hefty new novel 11/22/63, Tom Mula’s one-man play takes something familiar... and comes at it from fresh directions. So while the work is resonant and easy to grasp, it’s never boring. Much of the credit for that “never boring” assessment goes to actor Ken Clement, now on stage at Actors’ Playhouse as Scrooge’s 7-years-dead business partner and 17 other characters — 18, if you count his contribution as the show’s storytelling narrator. Sculpting the show with director David Arisco, Clement achieves the variations in voice, physicality and attitude required to differentiate the many characters. He makes all the rapid-fire shifts necessary to create a conversation between two characters, and he’s so adept at it that you feel you’re watching grumpy Jacob Marley haranguing the mischievous demon Bogle, then seeing the old sourpuss getting as good as he gives. Jacob Marley’s Christmas Carol is never going to ascend to the pantheon of beloved holiday fare, not the way Dickens’ A Christmas Carol has. As playwright Mula notes in the text (and as included samples from the original amply demonstrate), Dickens is simply a much better, more ingenious writer. But when an actor of Clement’s caliber turns his trained, mellifluous voice and considerable acting skill to all those characters, Jacob Marley becomes an impressive alternative to one more trip into Scrooge’s world. Jacob Marley's Christmas Carol plays at Actors' Playhouse through January 1, 2012. The national tour of Shrek The Musical opened at the Adrienne Arsht Center for the Performing Arts on December 6, 2011. SHREK THE MUSICAL, based on the Oscar®-winning DreamWorks film that started it all, brings the hilarious story of everyone's favorite ogre to life on stage. In a faraway kingdom turned upside down, things get ugly when an unseemly ogre – not a handsome prince – shows up to rescue a feisty princess. Throw in a donkey who won't shut up, a villain with a SHORT temper, a cookie with an attitude and over a dozen other fairy tale misfits, and you've got the kind of mess that calls for a real hero. Luckily, there's one on hand… and his name is Shrek. Featuring a terrific score of 19 all-new songs, big laughs, great dancing and breathtaking scenery. Stephen Sposito directed a cast that included Lukas Poost, Liz Shivener, Andre Jordan, and Merritt David Jaynes. The ensemble numbers are clever and well done, (wonderful dancing rats) but far too few, and that's just one of the problems with this production. We are treated to far too much Ogre and The Princess angst. The show is messy, some characters like Farquaad (a marvelously funny Merritt David Janes) and Donkey, played by André Jordan, are well portrayed, others are just annoying and unintelligible. The music, by Jeanine Tesori, is not really memorable and is easily topped by the entire cast performing a raucous version of Neil Diamond's old rock song, “I'm A Believer,” as a closer after the curtain call. Streaks of imagination and wit surface frequently, but this generally unengaging mediocrity misses the effortless irreverence in Dreamworks’ animated romance between a large green ogre and a beautiful princess. ...this fairy tale theoretically designed to enchant children and tickle adults doesn’t cast much of a magic spell because the creators simply haven’t found the winking subversive alchemy that was innately part of the 2001 romp. Here, even the nose-thumbing jokes seem as calculated as a Disney theme park ride. One of the real problems with the show is its score by Jeanine Tesori, the unassailably talented composer of Violet and Caroline, Or Change. She could not be a worse fit for the material. Tesori writes art songs that make you think, exemplified by a stubborn aversion to staying in anything resembling the same tempo, key, rhythm or meter for more than four bars of music. That’s fine when a show aims to force the audience to think deeply, but not for one that is essentially a mindless goofy spoof. It was also hard to know opening night whether large sections of the score were totally absent melody or whether the sound board allowed the orchestra underscoring to drown out the singers’ melody line. Half the lyrics by Lindsay-Abaire were unintelligible. You can’t fault the energy or singing ability of the cast, especially Liz Shivener as the spunky Princess Fiona (although she lacks her cinematic avatar’s independence) and Merritt David Jabes as the dwarfish villain Lord Farquaad (the actor gleefully dances on his knees while hiding behind tiny fake legs). Lukas Poost is adequate as our hapless hero but he doesn’t have the film Shrek’s rare mix of lovability and curmudgeonability. He had it in the opening scene, but it evaporated soon after. The most inspired part of the production is its use of puppetry based on scenic designer Tim Hatley’s vision. There’s a wise-cracking gingerbread man barely a yard tall plastered to a pan, a cow jumping over a moon and above all, a spectacular War Horse-type creation of a huge female dragon who flies over the other actors, plops to her haunches, bats her eyes and curls her tail. Shrek the Musical got decent reviews and ran on Broadway for more than a year. No, that isn’t Lion King huge, but Shrek works as theater. And as you’ll see if you catch the touring production at Miami’s Adrienne Arsht Center for the Performing Arts before its short run ends Sunday, the show is (like Shrek himself) one big hoot. ...Kids love the pretty princess, the cool giant dragon puppet, the wise-cracking Donkey and the belching-flatulence contest between Shrek and Fiona. Adults dig the smart, wry humor, a combination of dialogue from the movie and great lines (and lyrics) by Pulitzer Prize-winning playwright David Lindsay-Abaire. And theater buffs get an extra layer of pleasure from Shrek the Musical, as way-versatile composer Jeanine Tesori fleetingly references a host of iconic moments from other musicals: Rose’s Turn from Gypsy for Mama Bear; Defying Gravity from Wicked for the vertically challenged Lord Farquaad; Take Me or Leave Me from Rent for Donkey; And I Am Telling You I’m Not Going from Dreamgirls for the Dragon; the flag-waving scene from Les Misérables for the fairy-tale characters. ...the talent does joyful justice to the show. Decked out in Hatley’s fanciful, Tony Award-winning costumes, a cast full of big voices takes the audience on a familiar-yet-fresh journey. Lukas Poost, who appropriates Mike Myers’ Scottish accent as Shrek, is (despite his facial prosthetics) expressive and endearing. Liz Shivener, who played Belle opposite another over-sized leading man in Beauty and the Beast at the Arsht last season, is spunky and winningly funny. André Jordan as the motor-mouthed Donkey and Merritt David Janes as that pipsqueak lothario Farquaad walk away with the funniest moments in the show — and Janes does so on his knees. Shrek the Musical plays at the Arsht Center through December 11, 2011. I don't know about you, but I'm still recovering from the Theatre League Holiday Party; it was a great turn out, and while I was far from the first to leave, a healthy contingent was holding out at the bar when I left. Mathew Korinko of Slow Burn Theatre Company, which won a Silver Palm for their breakout work this season, made a point of thanking me for being the first to announce their existence back in 2009. Well, thank you for producing excellent plays! Anyone can make the promise, but it takes dedication and hard work to deliver what you have. You earned that Silver Palm. And in fact, everyone did. Someone pointed out that the nice thing about the Silver Palms is that it's not a competition; it's simply recognition. No one is competing, because the categories are created on an ad hoc basis that best fits what the party has accomplished. Maybe next year we'll see some stage managers getting some notice. Hint hint hint. Anyway, it was a lovely time, your loss if you missed it, and my Remy Award is getting admiring glances from folks at the office. Actors' Playhouse opens Jacob Marley's Christmas Carol, which plays through January 1, 2012. Zoetic Stage opens The Santaland Diaries at the Arsht Center, through December 23, 2011. The Maltz Jupiter Theatre production of Joseph and the Amazing Technicolor Dreamcoat plays through December 18, 2011. New Theatre presents Twain and Shaw Do Lunch at their new home at The Roxy Performing Arts Center through December 18, 2011. The Broward Stage Door Theatre opens Irving Berlin's I Love A Piano in Theatre 2, through January 8. Woyzeck, the Muscial plays at The Jesus Quintero Performing Arts Theatre through December 18. Palm Beach DramaWorks launches its new space with a critically acclaimed production of Arthur Miller's All My Sons. Through December 11. Extended through December 18, in a space that is DOUBLE their old one! Laffing Matterz returns to the Broward Center's Abdo New River Room, for its third season of dinner and comedy. The Miami StageDoor production of The Prisoner of Second Avenue closes December 11. GableStage's production of RED runs through December 4 ends its extended run on December 11, 2011. Shrek: The Musical plays at the Arsht Center through December 11, 2011. A Christmas Carol plays at the Broward Center's Amaturo Theater through December 11, 2011. Yo Gabba Gabba LIVE! plays at the Broward Center's Au-Rene Theater through December 11,2011. Madeline's Christmas plays at Actors' Playhouse through December 24, 2011. Jesus Quintero Performing Arts Theatre opened its production of Woyzeck on November 26, 2011. Jesús Quintero, artistic director and actor, will bring his original adaptation of Büchner’s Woyzeck to the stage. In Quintero’s vision, Woyzeck is a soldier living in the modern day and has arrived home from serving in Iraq. Suffering from Post Traumatic Stress Disorder (PTSD), Woyzeck hears the voices of a degrading military Captain and a Doctor, voiced by Roger Martin, who psychologically abuses him and plays on his jealousy over his girlfriend’s infidelity. Jesus Quintero directed a cast that included himself, Francesca Toledo, Randy Garcia, and Matthew Garcia. Go see the Jesús Quintero Performing Arts Theatre’s production of Georg Brüchner’s Woyzeck, and you’ll have the sort of alternative theater experience that doesn’t happen often in South Florida. Tragic, intriguing, odd, confusing, provocative: All of those descriptions apply to Quintero’s Woyzeck. Utilizing a haunting collection of Tom Waits songs from a 2000 Robert Wilson-staged production of Woyzeck, Quintero turns the play into a study of an Iraq War veteran suffering from Post Traumatic Stress Disorder. This Woyzeck (Quintero) has come home psychologically ruined. His girlfriend Marie (Francesca Toledo), mother of their baby, looks pretty haunted herself as she tries to cope with her agitated, tormented man. Both Garcias do double duty as the production’s musicians, playing and singing the Waits songs in a way that does the singer-songwriter justice, injecting the rock theater songs with a kind of Bertolt Brecht-Kurt Weill sensibility. Quintero and Toledo sing as well, he achingly in character, she sometimes off key. The director’s adaptation of Woyzeck is minimalist when it comes to storytelling, so you’ll absorb much more from the production if you review Brüchner’s plot before you go. Nor does the jump from 19th century Germany to 21st century Miami always translate: Woyzeck’s illegitimate baby, a source of shame in the original, would be unremarkable today. Quintero’s interpretation of the play, however, is all too relevant. As in Brüchner’s time, wars can keep claiming victims long after the battles are over. Jesús Quintero, who in recent years has given us The Hour of the Wolf and The Sorrows of Young Werther, gives us here his version of George Büchner's 1836 unfinished piece that finally received its premiere in 1913 in Munich. ...there was also a bandstand on which Randy Garcia played drums and Matthew Garcia played guitar and synthesizer while they, and Quintero and Toledo, sang the songs of Tom Waits. While none are Domingo, Sinatra or Fitzgerald, they imbued the music with such feeling that the pain of the confused, betrayed warrior overrode the entire sixty-five minute evening. The four players were exactly right for this piece; as in the music, any flaws in performance simply lent truth to the story. Woyzeck plays at the Jesus Quintero Performing Arts Theatre through December 18, 2011. 'Tis the season; it's the Theatre League of South Florida Holiday Party is tonight at the Bimini Boatyard. There will be food, drink, camaraderie, and awards. Lots of awards, as they will be presenting Silver Palm Awards to over a dozen deserving recipients, as well as two Remy Awards - the Pioneer award to Meredith Lasher, and the Service Award to yours truly. Hope to see you there! If you can't make it tonight, next week you have the second annual Holiday House, the mixed-bill offering of Conundrum Stages. Cirque Dreams Holidaze is coming to the Broward Center for the Performing Arts in just a couple of weeks, and the Boca Raton Observer has a 4 page pictorial about it. The Palm Beach Post reports that Louis Tyrell joins Delray Beach's fledgling Arts Garage to head up its theatre component. Tyrrell estimates The Theatre’s operating budget for its first season to be in the range of $150,000. He plans to inaugurate it this February with a Master Playwright Series: four weekly play-readings/lectures on Tuesday evenings. Already committed to participate are such nationally known dramatists as Israel Horovitz, John Guare and William Mastrosimone, who will talk about the featured works, the creative process and the state of theater today. There are plans to give Florida Stage's former subscribers admissions to some performances on a space-available basis. The Playgoer analyzes TCG's recent survey that shows that subscription ticket sales have dropped an average of 15% nationwide since 2006. The Drama Queen tells us about two different projects with "avenue" in the title: Avenue Q at Area Stage, and Teo Castellano's NE 2nd Avenue at the Arsht Center, which is one of several projects Teo is working on. Actually, that second article is more about Castellano's workshops at The Playground Theatre; I just couldn't resist the wordplay in the title. Florida Theater On Stage takes a look at how the Maltz Jupiter Theater keeps track of the 240 young performers contributing to its production of Joseph and the Amazing Technicolor Dreamcoat. The Palm Beach Post tells you about the kids. An TC Palm catches up with Jodi Langel, who plays The Narrator. The Miami Herald touches base with David Arisco, artistic director of Actors' Playhouse. Arisco recently started working out to help him tackle the role of Edna Turnblad in the Playhouse production of Hairspray. The Miami Herald also tells us about another play that has a part for a very large person: Shrek the Musical, opening at the Arsht Center this week. Lukas Poost plays the title role. Florida Theater On Stage takes a look at something new from Promethean Theatre Company; children's programming. Presumably, there will be no zombie attacks or episodes of hilarious cannibalism. Meanwhile, Yahoo News (don't ask me, I just find'em) reports that Mad Cat Theatre Company's next production is also aimed at children. And not in that spraying-down-the-kids-with-a-hose-to-get-them-off-the-lawn kind of aim, either. It is the story of little Macbeth and his request for a bedtime story to help him fall asleep. But when his mom tells his him the scary story of "Macbeth and the Monster," he gets way more than he bargained for. New Theatre opened its new play in a new space. Chamber Stephen's Twain And Shaw Do Lunch is the company' first production at The Roxy Performing Arts Center. This witty and based-on-truth play is set in 1907 when the world's two greatest living writers, Mark Twain & George Bernard Shaw, had lunch together. This, their first meeting, was monumental. It would be Mrs. Shaw's job to make sure they didn't destroy each other. Stephen A. Chambers directed a cast that featured Stephen Neal, Bill Schwartz, and Pilar Uribe. With no dramatic conflict, no character development and no narrative arc, Stevens’ 90-minute comedy is primarily a procession of the title characters telling each other funny anecdotes and plying each other with witticisms. It’s possible that two supremely gifted actors with irresistible charisma could invest this script with enough verve and topspin for the content alone to be entertaining, but Stephen Neal as George Bernard Shaw and Bill Schwartz as Samuel Clemens are simply competent journeymen. Stevens acknowledges that much of the script – a fictional account of a real meeting – is drawn from the duo’s writing and speeches. The problem in this production directed by New Theatre Literary Manager Steven Chambers (no, not the same person) is that the script sounds exactly like that: an artfully woven pastiche of the sages’ greatest hits. Uribe’s energy drives the first third of the play, but she is offstage struggling to fix an indigestible dinner for long stretches, leaving the play’s forward motion to the century-old quips and tales. In a white wig and moustache, Schwartz looks and moves like the aging lion, but the only time he gets to show his acting chops are in a few sad reveries about the loss of his wife and daughter. Neal tries hard, but he doesn’t look, sound or act like any incarnation of the curmudgeonly and intimidating Shaw we’ve ever heard of. The New Theatre world premiere of (Chamber) Stevens’ script, the first production at the company’s new home at Miami’s Roxy Performing Arts Center, has been directed by literary manager Steven Chambers. And yes, the flipped first and last names of playwright and director is a funny coincidence, not a typographical error. If only Twain and Shaw Do Lunch had turned out to be similarly amusing. ...director Chambers is able to move his cast around a set that would never have been possible on the company’s tiny stage in Coral Gables. Designer Andrew Rodriguez-Triana tries to suggest the Shaws’ affluence, but it’s tough to approximate elegance on a thrift-shop budget. Chuck Roeder’s period costumes (including a trademark white suit for Twain) and Ricky J. Martinez's lighting design work well, but several botched sound cues marred a key opening weekend performance. As for the actors, Schwartz fares best as the wry, deadpan Twain. Neal’s trained, American-sounding speaking voice isn’t hugely different from Shaw’s... but Neal is saddled with playing a man who seems more like the beleaguered lead in an inferior Neil Simon comedy than a deep thinker who would go on to win the Nobel Prize for literature. Uribe efficiently plays straight woman to the famous gents, though she struggles with projection and a light Irish accent which she eventually discards. New Theatre presents Twain And Shaw Do Lunch at The Roxy Performing Arts Center through December 18, 2011. Joseph and the Amazing Technicolor Dreamcoat opened at the Maltz Jupiter Theatre on November 29, 2011. This colorful retelling of the story of Joseph, his coat of many colors and his amazing ability to interpret dreams is a musical blockbuster of Biblical proportions! Andrew Lloyd Webber and Tim Rice’s award-winning musical parable features a delightful array of musical styles, from country-western and calypso to bubble-gum pop and rock 'n' roll, entertaining your entire family. Mark Martino choreographed and directed a cast that included RAndy Aaron, Nathanil Braga, Jeffery Bruce, Carl Draper, April Holloway, Jodie Langel, Julie Kavanagh, Ben Liebert, Ricky Nahas, Dennis O'Bannion, Brian Padgett, Jo Patrick, John Pinto Jr, Kevin Quillon, Nico Ramirez, Mary Elizabeth, Lauren Sprague, and Ryan Williams. Hurricane season is finally over, but the theatre season is still in full swing! Hard to believe it's December, and time for all the holidays, but here we are! 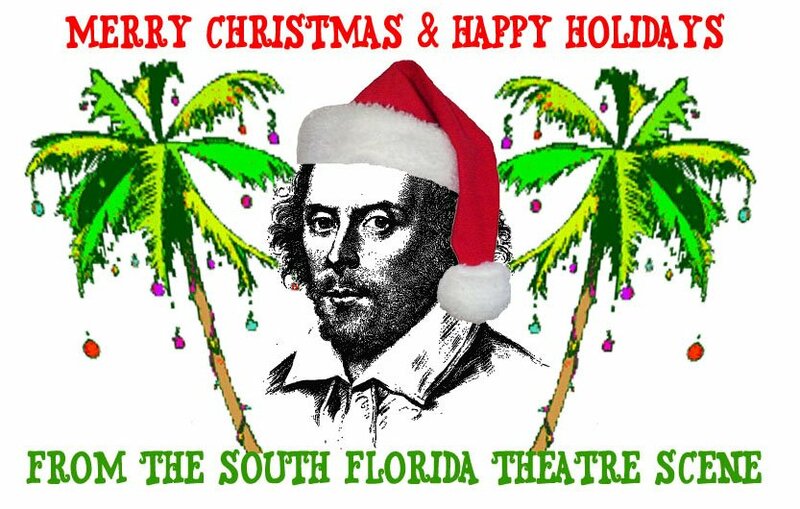 Speaking of holidays, the Theatre League of South Florida is holding its holiday party at the Bimini Boatyard restaurant, 1555 SE 17th Street, Fort Lauderdale, on Monday, December 5, at 7:30 pm. Not just a party; the League will be presenting Remy Awards to myself and Meridith Lasher, as well as Silver Palm Awards to dozens of deserving actors, directors, and designers. Admission is free for League members and $25 for non-members. For more information email andie@southfloridatheatre.com. The Maltz Jupiter Theatre opens its production of Joseph and the Amazing Technicolor Dreamcoat, which plays through December 18, 2011. New Theatre opens Twain and Shaw Do Lunch at their new home at The Roxy Performing Arts Center. This allows a developer to build more shopping space in Coral Gables, because I guess all those empty stores on Miracle Mile are already taken. The Miami StageDoor production of The Prisoner of Second Avenue runs through December 11. Yes, the websites are now separate. GableStage's long-anticipated production of RED runs through December 4 has been extended to December 11, 2011. The Mosaic Theatre production of Lombardi heads to the showers on December 4. Guys and Dolls winds up its run at the Broward Stage Door Theatre this Sunday, December 4th. The Kinsey Sicks Oy Vey in a Manger plays two shows only this Saturday at the Broward Center for the Performing Arts. My Fair Lady plays one night only at the Kravis Center for the Performing Arts on Saturday, December 3. Math Rocks! the Broward Center for the Performing Arts at 10am Friday. But if you miss it, you can catch it at the Miramar Cultural Center/Artspark on December 7. A Day in the Playground plays at Area Stage through December 6th.